For the Cowboys there is no time to dwell on K-State loss. STILLWATER — The 2018-19 Oklahoma State basketball season has been both long and short. From the Charlotte meltdown to the highs of the AdvoCare Invitational to the dismissals, the season hasn’t been short of storylines, yet still it doesn’t feel as if there are only 10 regular season games left. Mike Boynton, Lindy Waters and Yor Anei met with the media Monday before the Cowboys head to TCU for a game Wednesday. Here are some talking points from those interviews. 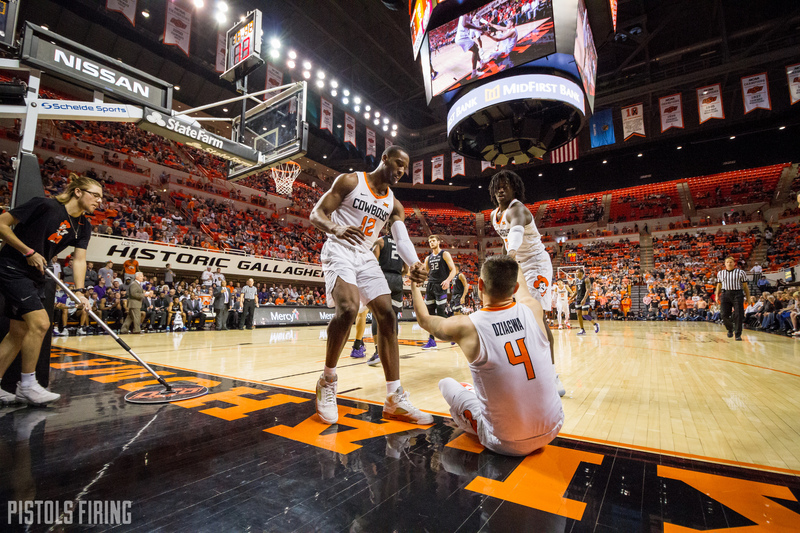 OSU got smoked in its game against Kansas State on Saturday in Gallagher-Iba, but with how tough the Big 12 schedule is and how shorthanded the Cowboys are, there’s no time to feel bad. Lindy Waters said the team had to move on immediately. The Cowboys have 10 regular season games left (two more than scholarship players on their roster) with any slim hope of playing past the Big 12 Tournament slipping with every loss. Waters said the team didn’t come into Saturday’s game with the right mentality and that the Cowboys got “out-toughed” on their home floor. With the Cowboys being outmanned, coach Mike Boynton has thrown a variety of defensive looks at opposing teams in hopes to keep his players’ legs fresh and out of foul trouble. From man-to-man to a 1-3-1 zone to a 2-3 zone to a 3-2 zone, communication is key when the team is switching it up. Boynton said if Saturday’s loss was any indication, OSU hasn’t done the best job at the switching, but he said the previous three games show that the Cowboys are capable. Communication has always been a priority for the Cowboys, especially on the defensive end, but when a team is constantly switching defenses, it can add some chaos. With the team’s six- to seven-man rotation, freshman center Yor Anei said the communication is growing because of the lack of depth. “Shoot, (the communication) has been probably the best it’s ever been because we’re a smaller group, so we’ve gotten closer,” Anei said. Former manager Tanner Taylor, new addition to the roster Gabe Simpson and five other new practice squad members have all joined the Cowboys training midway through the year. It might be a little awkward for seven guys to come into an already existing nine-man team, but, even if out of necessity, the Cowboys have made it work thus far. The practice squad members are obviously not a mirror of the talent level the Cowboys will face in games, but Boynton said the system has worked out so far. “The very first day they were out here, they kicked our guys’ tails for a few minutes,” Boynton said. “A. Because our guys don’t know anything about them, and they also have no pressure on them to actually perform anything well. They just get to play hard. They did that, and our guys kinda were shocked.